Thanks to their unique Hygienic design, LAPP stainless steel cable glands greatly reduce any risk of contamination or deterioration caused by harsh wash downs, microbes and bacteria. This means a reliable cabling solution that virtually eliminates the risk of failure on your production line while satisfying the high hygiene standards of the Food & Beverage industry. To receive your 20% discount, enter discount code HYGIENIC20 at checkout on our web store. View Skintop Stainless Steel Range Now! Promotion valid from 21st August to the 30th September 2018. Special 20% off promotion applies to Skintop Hygienic & Inox range only. 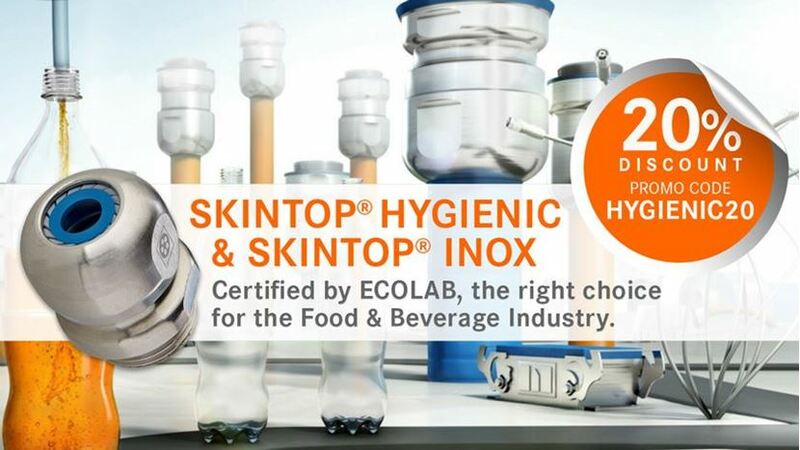 Click on the video below to know more about the Skintop Hygienic in action.